Although this may sound like something your granny would do it actually makes very good financial sense and is the ideal option if you're on a tight budget. Ignore any remarks from your housemates and, instead, watch with a smug grin on your face when they scrape around for the makings of a meal as you tuck into delicious homemade food night after night. Cooking in bulk is really nothing more than making a bit extra and then storing the surplus food in the fridge or freezer until it's required. No extra cooking skills are required but you will need to have a little food knowledge as it's not always as simple as doubling the amounts in a recipe. For example, certain spices and seasonings are calculated to work exactly with the other ingredients - chucking in twice as much chilli powder might ruin the dish. However, with relatively straightforward recipes and dishes, you should be able to just increase the amounts. It's always a good idea to taste the food as you go along (obviously not while meat or chicken is still uncooked), to ensure the flavours are working and you'll soon get a feel for the amounts of ingredients you need to double or treble the dish. Cooking in bulk allows you to work out your food budget more accurately. You can do a big shop at the beginning of the month, or whenever your bank account is looking most healthy, and then you can plan meals around that. That way you can use up all your fresh vegetables soon after purchase and ensure you have healthy meals to hand, even when the money has run out. 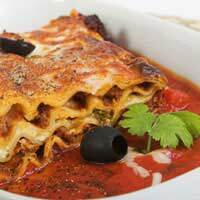 One large lasagne or shepherd's pie can be divided into single servings and could make as many as eight meals. Do think about variety though - however good your lasagne tastes, you might want it every night for a week. So, unless you're particularly keen on one meal, then it's probably best to have a couple of options to choose from. If you don't have a microwave and your meals are frozen, don't forget to transfer them to the fridge so they have time to properly defrost before cooking. Once you get into the habit of bulk cooking you'll find it really does make life easier. You'll save valuable studying and drinking time, as all you need to do is heat up your dinner. You'll also be quids in at the end of the month! Go into supermarkets late in the day and pick up reduced veg, Take home cut up in dinner portion Bags up in freezer bags Put in freezer til you are ready to eat Just done 3 bags of runner beans for a £1 - got 10 portions.... RESULT!!! @kate. There is a reliable recipe for cappucino traybakes - which works well as a chocolate traybake if you substitute cocoa powder for the espresso here. It makes 18 squares so make two (or even 3 to have plenty) for a quick and easy sponge. To make a chocolate custard, the easiest way is to buy some custard powder, make it up in the usual way on the hob (don't forget you need caster sugar and milk too) and add some cocoa powder to taste. Use good quality cocoa powder for both the custard and the sponge (& don't try to use drinking chocolate as it has added sugar and milkpowder so you won't get the same flavour).